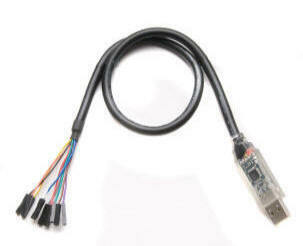 The USB-MPSSE cable is capable of providing a USB to SPI, I2C or JTAG interface. This is accomplished by the MPSSE within the FT232H device which has the ability to emulate synchronous serial protocols while handling all the USB signalling and protocols. To expedite application development, FTDI has provided libraries which handle the MPSSE commands to emulate several protocols. NOTE: use of the MPSSE libraries requires that FTDI's D2XX drivers are installed. The following application notes show practical examples of using the new USB-MPSSE cables to interface to SPI and I2C busses. These provide full explanation and source code examples of how to configure the MPSSE of the new cables. The USB 2.0 Hi-Speed to UART cable incorporates FTDI’s FT232H USB to UART interface IC device which handles all the USB signalling and protocols. The cable provides a fast, simple way to connect devices with 3.3 volt digital interfaces to USB. For full details, features and enhancement descriptions of the FT232H please refer to the FT232H datasheet. The digital interface of the cable is made up of ten individual wires which are terminated with single pole connectors which can be connected next to each other on a male header. The cables digital interface logic is 3.3 volts.